Forecasters are calling for total accumulations of 8- 12" by the time the storm winds down tomorrow. Jammies inside-out! Olavi will be grooming overnight and tomorrow morning. We expect to have 47km of trails open (94% of our system). 35km will be groomed with trackset and skating lanes and 12km will be open for snowshoeing. The only portion of the system that will be closed will be skiing directly on Woods Lake (3km) as the ice is still thin. 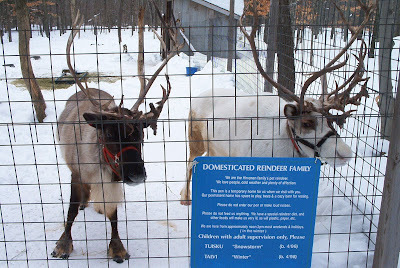 Our children's tubing hills will also be open, and our two beautiful reindeer, Talvi and Viima, are anxious to see you!